Although a business plan contains material specific to your business, markets and stage of development, the following is a list of key topics. You will see that you are well on your way because you have developed the vision, goals and market plan from the first three modules. The example below is for a sample business in food and agriculture that is established but expanding. A more detailed sample table of contents is linked as well. 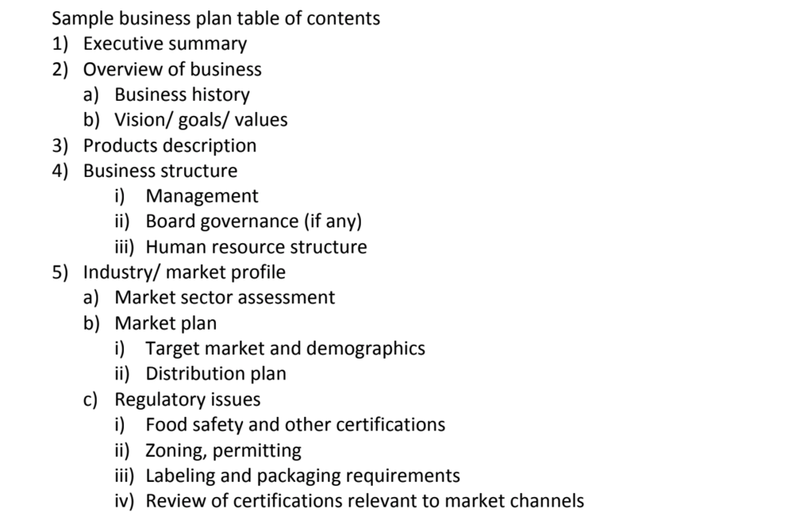 Sample business plan table of contents. Click to view this PDF. The following sections offer a brief description of each section and why it is relevant. There can be many variations of the basic design, usually as additions to the core topics listed here. This section focuses on the operations (what you do, what you produce, where you sell it). It includes your vision, goals and values, as well as a review of the past history of the business. This section draws on the planning in the other three modules, and describes the product you will be producing. This section describes how the business is set up (sole proprietorship, family-owned corporation, private corporation, co-operative, joint venture, partnership). This section will also describe the tax status. Non-profit businesses sometimes face misunderstanding of the model, and should describe the attributes of a non-profit here, their ability to have a surplus and offer a return on investment regardless of the tax status. The section is key for potential investors, members or funders to understand who will be making the decisions, and what opportunities the business has for equity investment. For funders and institutional lenders, this section will clarify models they may be unfamiliar with, such as multi-stakeholder co-ops, or social enterprises. If there is a Board or advisory committee, this section will explain their function. The section can also review the human resource framework: management team, staff, casual labour requirements, etc. What are the opportunities and challenges in this market sector? What are the trends, risks and forecasts in this market sector? Then it will describe the plan developed in the other modules. What are the demographics and consumer patterns in that market (as identified during the market research)? Work with a distributor to market and deliver to customers? Sell through an online market? This worksheet provides a template to weigh different approaches to distribution and make sure you are choosing one that works for you. It provides a decision-making form to help assess different types of distribution in case you have not already completed this part. Distribution Options worksheet. Click to view this PDF. In this video, Jennifer Pfenning discusses the best practices for working with a distributor, as well as the business model at Pfenning’s Farm, where they act as a producer and distributor for their own and others’ products. In this video, Kevin Van Groningen discusses collaborative marketing and the distribution model at VG Meats that markets through different channels to sell different cuts of meat from their provincial abattoir. Take an online tour of the VG Meats facility. Finally, the market plan will also discuss the key messages and tactics identified in earlier modules. Policies related to food sales, local food, export, etc. In this short video, Avia Eek discusses the regulations that they work with as farmers in the Holland Marsh north of Toronto. This resource from the Golden Horseshoe Food and Farming Alliance provides a step-by-step guide to permitting and zoning applications for agricultural use. Click to view PDF. This research report accompanies the GHFFA guide, and reviews the current situation for producers in Ontario. Click to view PDF. In this video, Amy Bumbacco from Thunder Bay Food Strategy talks about their work on local food policy in Thunder Bay. The Ontario MInistry of Agriculture, Food and Rural Affairs, as well as other provincial and local government sites and staff, are the best resources to ensure you understand regulatory and permitting requirements for your plan. Some regions (for instance, the Holland Marsh) may have regional associations of producers and processors with staff who advocate, research, and provide guidance in regulatory issues. The finance section will include the costs of production and pricing from the earlier modules, as well as a multi-year budget for the project. Budgets include revenues and expenses, broken into fixed and variable costs. A new product line should be portrayed in an independent budget plan so that all the elements can be seen without being confused with the existing operations. However, expansion of an existing product might mean taking an existing budget and showing the effects of volume increase to an existing product. Although this section will mostly provide tables, a narrative overview is a good introduction to complex spreadsheets. This webinar from Jessica Kelly offers a way to do a simple calculation as well. Both types of planning are useful; it is up to you to decide what level of complexity is appropriate to your needs, capacity and current context. A section of the budget plan will address labour needs and costs. Some of these are part of start-up (the cost of training new and existing staff on new procedures and machinery) while others are part of the regular (fixed) costs of operating the new business. A narrative in this section may address the plan for bringing in new workers, with a timeline and training options (third party or in-house). This document provides a useful list of a chart of accounts. It is designed for a retail store, but it can give you some ideas about costs that you might have missed. Click to download this Excel spreadsheet. This spreadsheet from OMAFRA provides a through framework to assess costs and develop a financial plan for your farm business. The expenses input tab on the Veggie Compass set of spreadsheets offers a good list of expense line items for diverse farms. Click to download this Excel spreadsheet. This spreadsheet from OMAFRA provides a through framework to assess costs and develop a financial plan for your farm business. Click to download this Excel spreadsheet. The budget section will include a budget for capitalization of the start-up and expansion. These are different from the operational costs, and must be taken into account. However, they can be estimated separately because the sources are unique and the expenses are singular, not part of running the business. These expenses will be incorporated into the operational budget through amortization and depreciation of capital assets. The start-up financial plan as well as the operational budget is often provided in scenarios (best, likely and worst case). Using a colour code or other device, the business plan can use the scenario framework to indicate break even levels of revenue and capitalization, “go points” of capital acquisition, and minimums below which the business cannot proceed. This section will include cash flow budgets. Cash flow budgeting allows you to compare the flow of revenue and capital to the expenses, and make sure they work together seamlessly. This is where you can identify serious problems. Example: You have a commitment from an investor who will give you the money in six months. Your plan shows that a deposit needs to be put on the equipment within three months, or the price will go up. You had planned to start a new staff person in the next month, but that will use up the reserves that will have to go to the deposit, since you will not have your investment funds yet. You will have to adjust the plan to keep your bank balance in the black. You could ask the funder or investor for an advance. You could decide to hold off on the new staff person for a half year. You could find another source of support. You could renegotiate the terms of the deposit. All these steps are possible solutions, and the cash flow budget is the tool that alerts you to the need for a solution. For potential investors, lenders and funders, it also shows that you have a clear and realistic idea of your month-to-month cash needs and sources. Module 5 will explore the question of finance sources. This resource from Iowa State University takes you through twelve steps to create a detailed cash flow budget. Click to view this PDF. 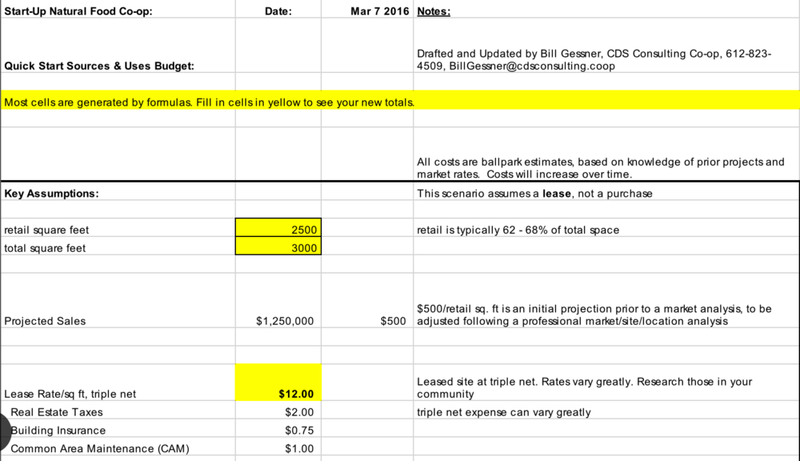 This template from Bill Gessner of CDS Consulting shows an example of cash flow budgeting based on sources of capital for start-ups. Although it is designed for a retail co-op store, it is relevant to a farm store or any other facility (such as a processing kitchen). Click to download this Excel spreadsheet. In this section you will take a hard look at your plan. It is important to investors as well as to many funders. It can take the form of a text that describes each possible challenge to the project, followed by the steps the business has taken or will take to address or reduce the risk. Risk can be understood by two factors: likelihood and impact on the business (see the summary graphic). This worksheet introduces some basic risk assessment strategies, and provides space at the end for you to develop your own assessment and mitigation strategies. Click to download this Word document. The indicators of success will differ from one business to another, and are derived from the vision, goals and values that were identified in the first module. They are useful to maintain a target and to assess your progress and achievements. They are also generally required for grant applications, so developing them now will save time later if you plan to submit grant applications. Team members should create these together, and they should be used in performance evaluations. If a business has job creation goals, then the managers must be held accountable for the number of jobs maintained or lost, rather than assessing their performance solely by the more common net profit and financial indicators. A process to develop and prioritize your measures of success is included in the Measuring Success worksheet below. This process begins from the Key Goals worksheet in the first module, so if you have not filled that out, it is linked again here. Click to view this PDF. Key Goals worksheet. Click to view this PDF. The results of your backcasting at the beginning belong here; you might need to add or change some of it now that you have worked through the other steps of the business plan, but that will be the basis of the action plan. In the final module, you will return to this to begin to plan in more detail for who will do each task, who will be involved, and what resources exist or are needed. This guide from the Minnesota Institute for Sustainable Agriculture provides more information, worksheets and ideas on Building a Sustainable Business. It is designed for farms and rural businesses. Click to view this PDF.